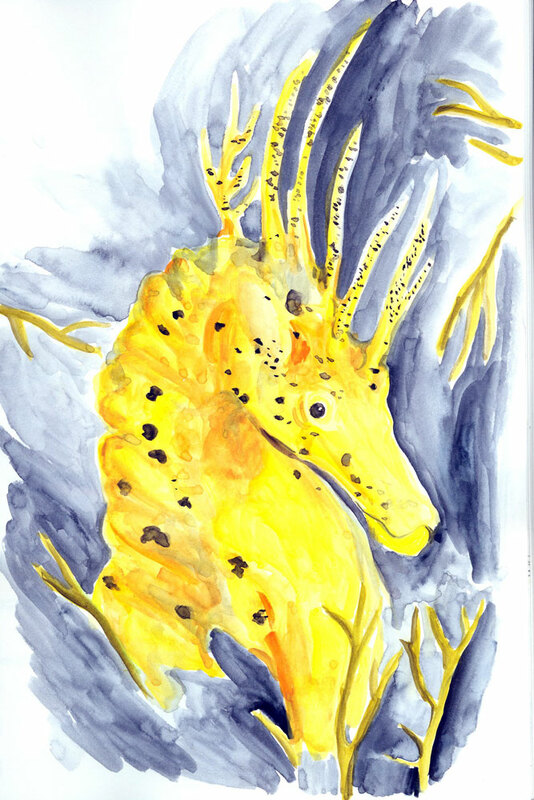 suitable for dry and wet media, watercolor, and ink. Categories: This just in! New products we are excited about | Tags: art supplies, Meg Nelson, Staff Picks, Stillman & Birn, Wet Paint St. Paul | Permalink. Back in the 1970s, if you were a serious art student, it was standard to carry a black bound sketchbook just like your professor. Besides being the repository of your sketches and notes, the binding gave you the sense of this being a permanent record, a uniform format that would be the historic record of the studies for your artwork. As this tradition continued through the decades, the black sketchbook began to evolve. Some artists didn’t like the roll of the page caused by the binding, so paper manufacturers started providing the field sketchbook: the same hard black leatherette cover but with spiral binding. Others introduced micro-perforated sheets that could be torn out discreetly. In doing so, the original intent of the bound book changed over time. The book could now be easily edited; pages torn out and discarded instead of kept archived in place and in sequence. By the beginning of the 21st century, the popularity of the black sketchbook made it quite a commodity item for the pad makers. Unfortunately, in order to compete with each other, this meant that many black sketchbooks began to come out of Asia with lower and lower prices and with paper of the quality of a cocktail napkin. This devolution of the quality of the black bound sketchbook only took into consideration that all art students and most artists wanted this product. They had lost track of the purpose of the book … They ignored the fact that paper quality could affect the drawings made on their pages. They totally missed the trend of artists working in mixed media which requires heavier and better paper. They didn’t notice the growing movement of sketching as an art form where the final work is kept within the sketchbook itself. And they lost sight of the vital role that the black sketchbook could play as a place to record ideas, document the creative process, and archive one’s development as an artist. 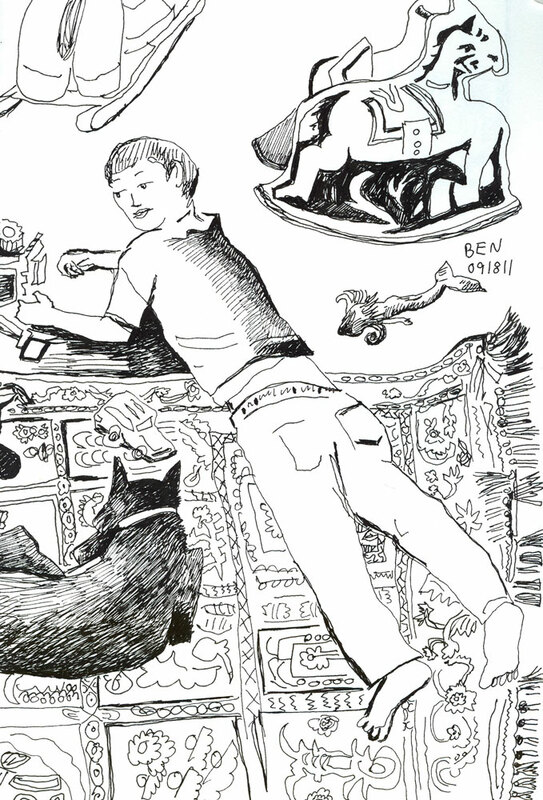 Wet Paint staff, Steve and Langhan, and the display of Stillman & Birn sketchbooks. As an industry, art materials has been ripe for the return of a quality black bound sketchbook and in 2011, Stillman & Birn did just that. Michael Kalman and Oscar Hernandez are the founders of Stillman & Birn. Michael is the nephew of the original manufacturer of the first black bound sketchbook in 1958. 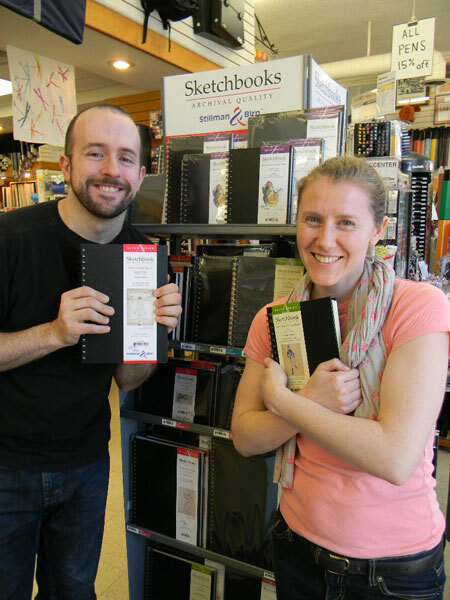 Michael and Oscar believe that artists need sketchbooks that are the same caliber as any of their other art materials. Stillman & Birn understands that all artists don’t work alike and need papers with different surface qualities, different weights, different levels of whiteness, and of course, different sizes and different bindings. They have listened to artists and worked to provide them with a line of bound sketchbooks that is as diverse as their needs. Stillman & Birn has sourced the finest quality papers from Europe and then bound them under the strictest quality control in the United States. They’ve mastered the challenge of featuring heavier papers in bound books in addition to spirals, and, most remarkable of all, their bindings will actually allow the pages to lie flat and satisfy the sketcher who wants to work across 2 pages. Stillman & Birn is a supplier that truly wants to provide artists with the best possible product they can afford and Wet Paint has worked closely with them in the improving of their product and the development of new items. Their commitment to the artist shows not just in the sketchbooks themselves, but in the amount of information that is provided on each book. Last month Stillman & Birn began shipping their new “Zeta Series” sketchbook to meet the demands of artists wanting a 180# heavy weight, natural white, smooth surface in both hardbound and wirebound books. And in June 2013, Wet Paint will have 22×30” individual sheets for each of the 6 papers featured in Stillman & Birn’s sketchbooks. This enables the artist to move from their sketchbook to a larger format without having to adapt to different surface qualities. Later in the year, we will have sampler sketchbooks which will include pages of all 6 papers so people can experiment will all the surfaces in the series. 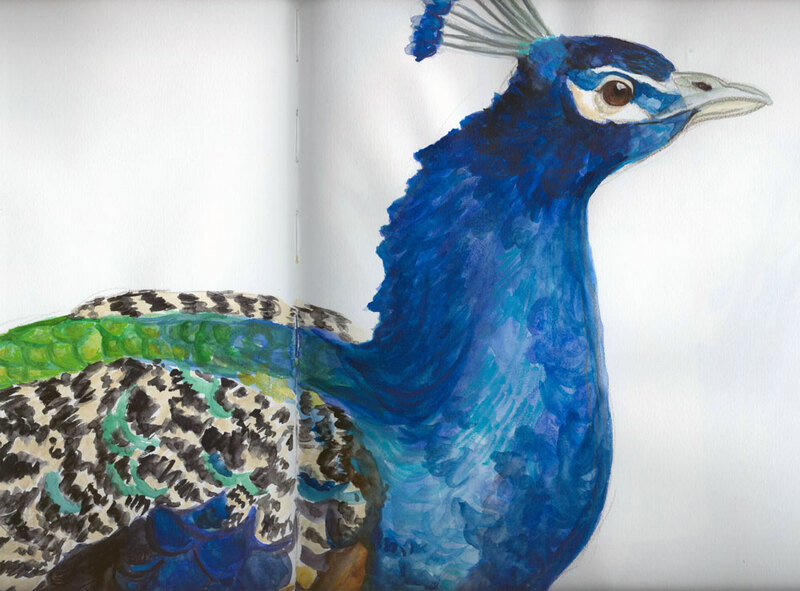 Visit Wet Paint in person or online to see the entire line of Stillman & Birn sketchbooks. 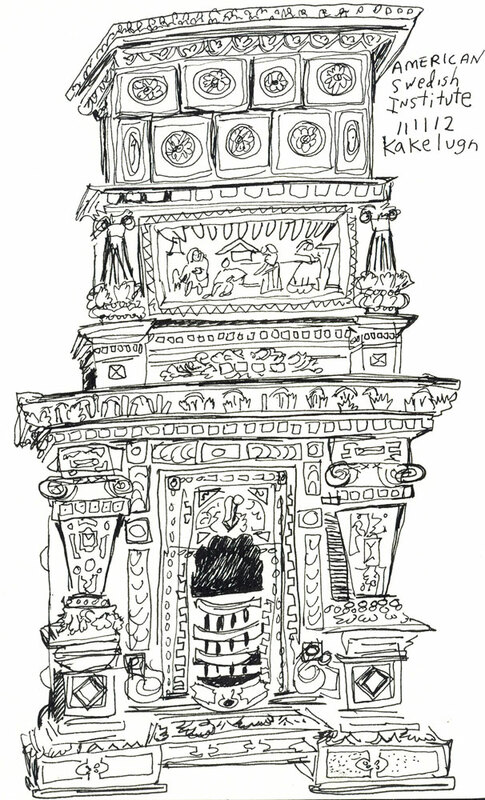 And visit the Stillman & Birn blog to see more examples of what artists are doing in their books. Categories: This just in! New products we are excited about | Tags: illustration, Journals, Justin Terlecki, Liz Carlson, paper, paper manufacturers, sketchbooks, spiral binding, Stillman & Birn, Wet Paint St. Paul, Zeta series | Permalink.